Our wooden frames are always 3cm deep. 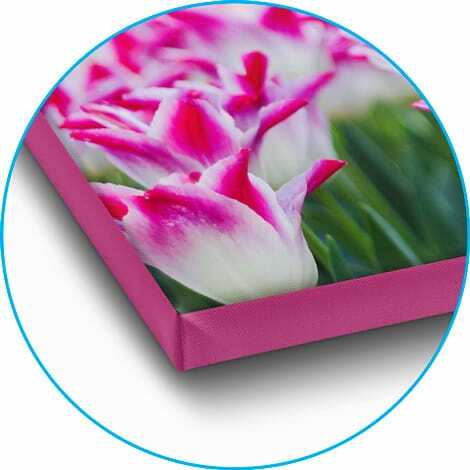 We carefully stretch the printed canvas over the frame. We always use the photo on the sides of the frame. This creates a beautiful and spacious image. It can sometimes happen that an essential part of the photo falls on the side of the frame. For example, because a head is close to the edge of the photo. This is obviously not desirable but also easy to solve in our clear cropping system. 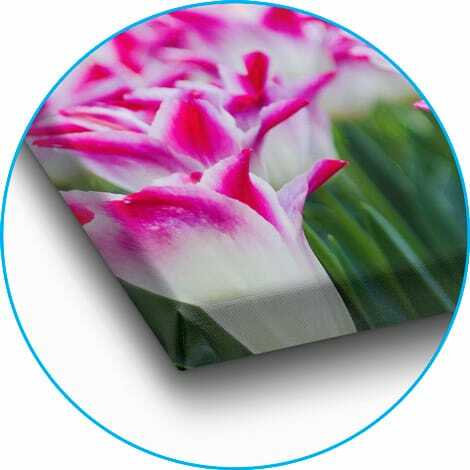 To place the photo on the front of the canvas in an optimal way, we offer various options for the sides of the canvas. With this option we take a small part of the edges of your photo and stretch it a little bit. This part then falls on the sides of the frame. It will not be visible in the end result, but ensures that most of the photo is on the front of the canvas..
With this smart option we take the end of the photo and mirror them. The mirrored edges then fall on the sides of the frame. Because of this, nothing will be cut from the photo. With this option we keep the sides of the photo on canvas unprinted or printed in a solid colour. Because of this, nothing is cut from the photo. With our colour picker you quickly and easily select your desired colour from millions of colours. In the box under the colour picker you will find the colour code of your chosen colour. We advise you to write this down and keep it for a next order. That way the sides of your canvases will have the exact same colour.